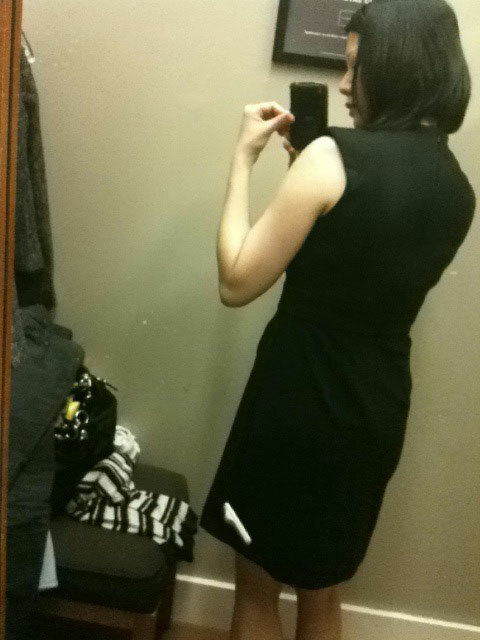 My armful of clothing to the fitting also included this beautiful Faux Wrapped Dress. The material is stretchy and drapes like a wrapped dress but it really doesn’t. The wrapped dress look is great for hiding tummies and it also accentuates the waistline. What I did not like about the dress was the deep V neck. Also the drape does not align with the hem of the dress. So you can see the inch or two of fabric dips below the hemline. That is one of my pet peeves. 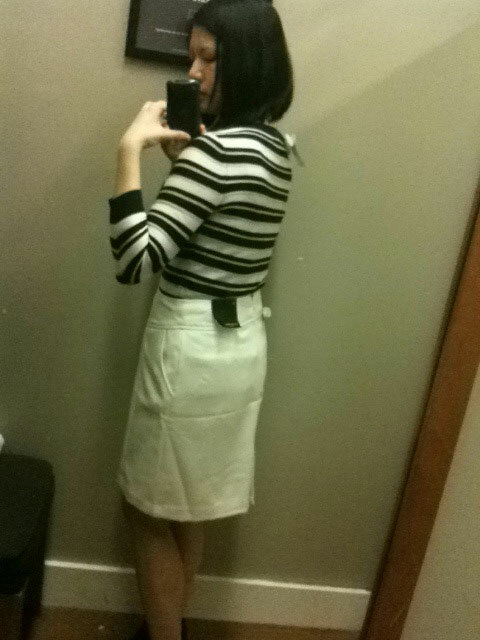 I picked up this white creamy skirt. Straight cut with side pockets that I thought would not look good with my body. But I think the cut proved that it fits very well. Another thumbs up is the striped sweater with metallic ribbons. 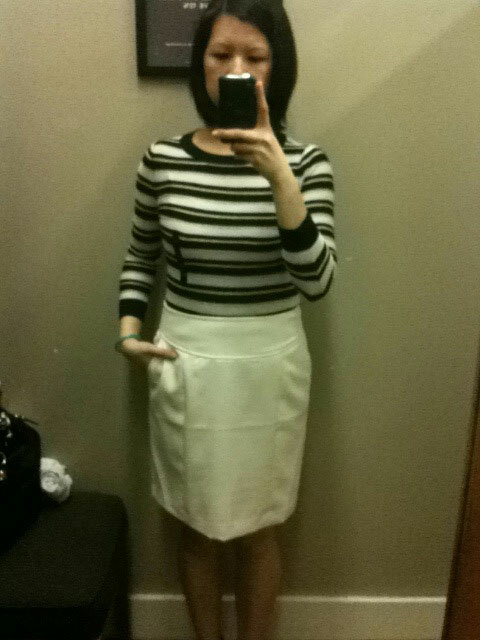 The thin stripes totally makes my chest look ample and highlighted my waist along with the contrasting white skirt. 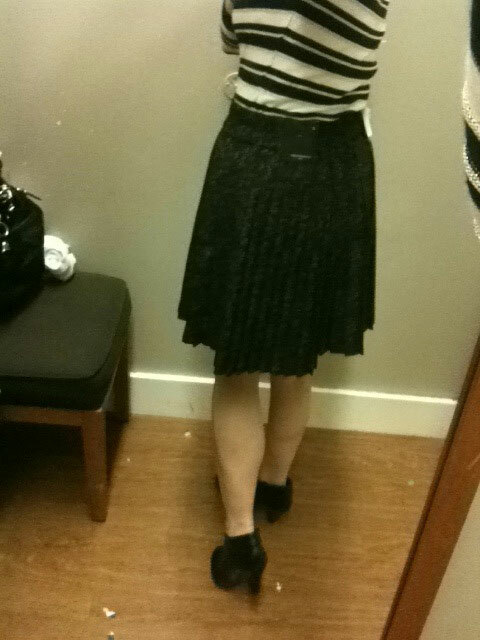 This Aline pleated skirt caught my eye because it looked like the Tibi Normandy skirt I had really wanted but couldn’t afford. The Banana Republic version featured a shorter length skirt opposed to the midi style of the Tibi skirt. The BR skirt had a brown floral against black while Tibi skirt was light brown against navy. 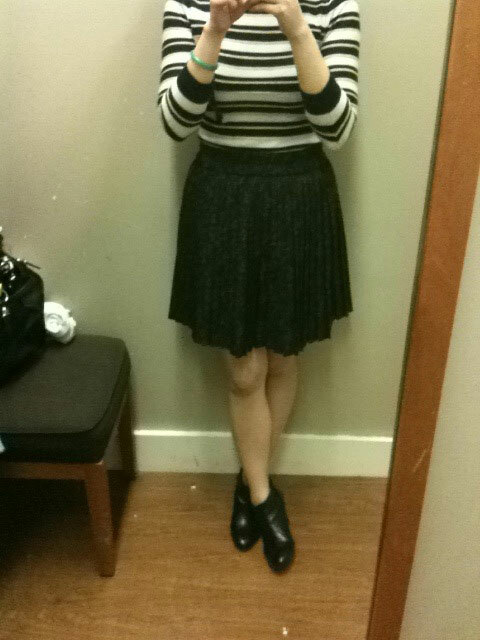 This skirt also went well with the stripes sweater. I was very pleased with my shopping success. What surprised me was the abundance selection in the petites section. I am 5’6″ not considered Petite but somehow the petite sizing works with my body. I was always frustrated that Regular Banana Republic sizing was so frumpy on me. I believe now I would shop more in the petites section. I did not purchase anything from this shopping excursion, due to a crying baby. My little Emma decided to get cranky so I had to put off my purchase. I will be going to Biloxi, MS soon and I know the BR outlet there is a really good one. Hopefully there will be better pricing. Yes in Biloxi I got the Trench in khaki. 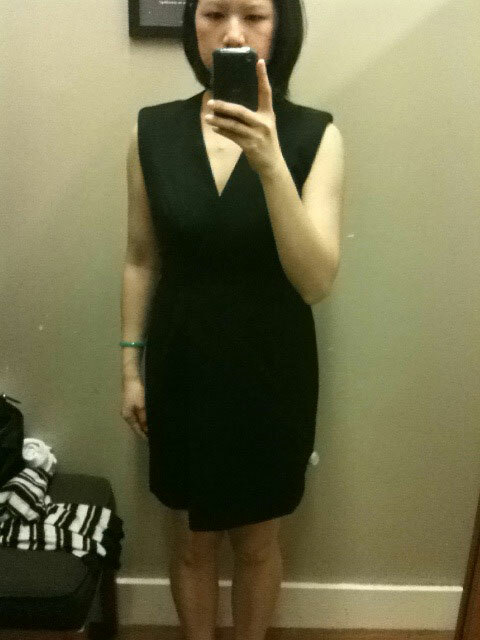 However when I retried on the sheath dress, it didn’t look as good. The bust wasn’t as fitted so it made the armholes seem loose. After having my 2nd child, my body kept fluctuating. Larger feet, bigger bust and tummy, wider hips. 2 years later I’m finally losing all the baby fat, so lately, I’ll fit it then don’t. The part I lost the most is my bust!